Merrily We Roll Along opened on Broadway in 1981 and now harbours a large following of Sondheim and musical theatre fans alike. However, this adaption does not have a leg to stand on should it be compared with the original production. The lack of basic directorial rules were not kept, with scenery being hauled on in front of scenes taking place and many lines were lost due to the loud nature and close proximity of the on stage musicians. However, this is certainly not a musical directors issue as the live music from the band is one of the major redeeming elements of this unpolished performance. Merrily We Roll Along tells the take of three friends as they try to make it big on Broadway, starting at the height of their fame working backwards to where it all began. It follows love affairs, marriages and childbirth all within the subtext of becoming successful. However, the monotony of working back a few years at a time is made extremely monotonous in Red Oak Tree’s production as they sing the title song at each transition as is scripted but changing little in the way of direction or choreography each time. The acting is very questionable with actors forgetting their lines and moves at numerous times throughout the performance. There is no shining star that grabs the audiences attention, which is not surprising for this very bland Sondheim production. The set is also just as confusing as the direction with posters hung up around the stage, from Spider-Man to Audrey Hepburn. If that stylistic decision was made to portray Broadway it really has not served its purpose as it feels more like a students bedroom than the bright lights of New York. This production is a tough endurance test. If you can make it to the end awake and still with a smile on your face you have done yourself proud. The live music is great but the acting and direction does not balance it out. 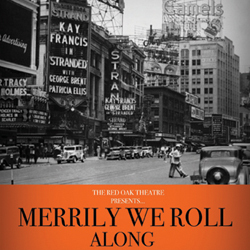 Merrily We Roll Along runs until the 24th August at Greenside.